Ewingsdale residents will get a second chance to have their say on a proposed retirement village in their midst after Byron Shire Council yesterday voted to require the developer’s proposal go out for public exhibition again. Council’s about-face came in the form of a rescission motion, withdrawing its previous resolution – taken less than a month ago – to change the zoning of the land in its new LEP. The remarkable decision was passed with just one dissention, Cr Alan Hunter, but followed heated and at times rowdy debate. From the outset, the passion of Ewingsdale residents was on show, with many of them holding placards supporting the rescission. During public access three residents spoke supporting the rescission motion, revealing that a door-knocking campaign of the area over two weekends had shown less than two per cent support for the plan. By contrast, 94 per cent of the 234 residents interviewed said they did not support the proposed development. Proponent Leigh Belbeck said during public access that she was ‘not fast-tracking or circumventing but following the gateway process’. She said ‘200 information leaflets were sent out to residents,’ brandishing a glossy DL brochure, and added advertising had also been bought in The Echo ahead of a series of information sessions she ran. ‘Approximately 100 people attended three meetings,’ she said. It’s not Belbeck’s fault if people weren’t aware or feel they didn’t have time to come. ‘A market research survey shows strong support from older residents,’ she added. 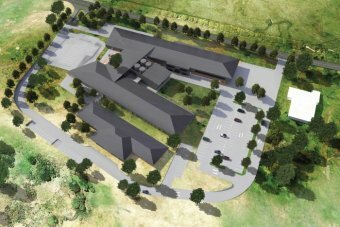 The plan originally got the tick to proceed to the state government’s gateway process from council in September last year after the government gave the go-ahead for the construction of Byron Central Hospital on the adjoining block. But mayor Simon Richardson was the first to admit the public consultation process was flawed because council had allowed the developers to run the process rather than doing so itself. ‘It was the worst decision I’ve made in six years and I accept that error. At that stage we had no inclination to do a growth management strategy and we had no opportunity to look at this strategically. What has changed is we now have that strategic planning process,’ he said. Cr Paul Spooner also urged fellow councillors to reconsider the motion in the light of the survey result. ‘People can change their mind because of new information. I think it’s very reasonable to have 28 days to have another look at it,’ he said. Cr Chris Cubis raised the spectre of the state government taking over planning control of the area if the council backtracked on its decision. ‘If we rescind this motion are saying we want this motion to be handed over to the state?’ he queried. ‘The people of Ewingsdale were informed. Whether they chose to “get informed” is another issue,’ he added. Cr Cubis then launched into a tirade at the mayor, blaming him for ‘a torrent of abusive email’ he had received over the issue. Cr Richardson retorted Cr Cubis had only his ‘own stupidity’ to blame, whereupon Cr Di Woods declared no confidence in the chair and demanded a vote. The matter was put to the vote, with only Crs Cubis and Woods voting in support. Under questioning from Cr Sol Ibrahim, planning director Ray Darney said he didn’t believe the state had the appetite to take on another Byron development, even if approached by the developers to do so. ‘It’s unlikely the department of planning would take over the project. Bayside Brunswick has been with them for 10 years and West Byron for six years,’ he said. He added, ‘we could likely get an extension but it wouldn’t be 28 days because we’d need an exhibition period after that. We would ask for six months,. Ultimately, Cr Ibrahim brokered a deal with the motion’s mover Cr Duncan Dey, which saw a clause deleted relating to the investigation of sewerage requirements without it having to go to amendment. Cr Ibrahim argued, and Cr Dey accepted, that as sewerage would be a necessity for the hospital it would be available for the site at a minimal additional expense. This face-saving arrangement allowed the pro-development councillors (with the exception of Cr Hunter) to vote together with progressive councillors to back the rescission and give the Ewingsdale residents their say. BYRON Shire Council decision to rezone land at Ewingsdale to allow a seniors living estate to be built will be challenged at the next council meeting. 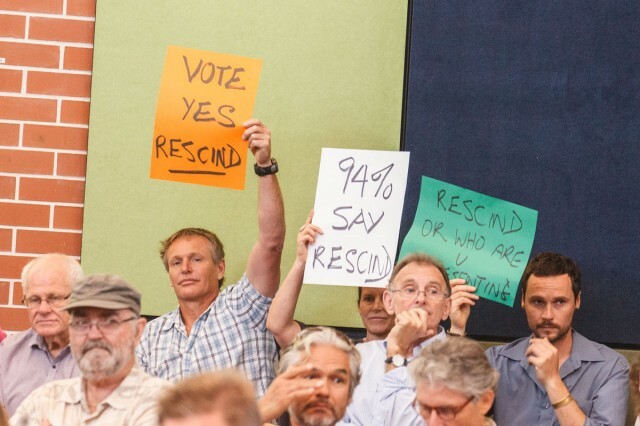 Byron councillors Duncan Dey, Simon Richardson and Basil Cameron have lodged a rescission motion against the rezoning to be debated at the council’s meeting next Thursday. Meanwhile, the developers of the Ewingsdale Seniors Living Plan, Belbeck Investments, have employed an independent market research firm to undertake more community surveys of Byron Shire residents aged over 55 to show the community at large supports the plan. “The feedback we had from our community consultation meetings in July was very positive and enthusiastic,” Belbeck Investments Director, Leigh Belbeck, said. The results of the phone survey will be presented to Byron Shire councillors before they debate the recision motion, Ms Belback said. He said the recent State announcement to fund the new shire hospital was a “game changer” and the concept was in response to a serious shortage of seniors’ accommodation in the area. Mrs Belbeck said four years of research had gone into identifying the site as being ideal for the project. “This region has one of Australia’s fastest ageing populations, but not enough seniors’ accommodation,” she said. The project would see multiple seniors living houses built; an aged care facility, while 1.65 hectares would be used for a medical centre, shops and cafes. The Byron Mayor has serious concerns about the development application lodged for a long-awaited hospital at Ewingsdale. Simon Richardson said although the council is not the consent authority, it will send a submission to the State Government. He said there are a number of issues which need to be addressed, including sewerage, parking, road access and noise. Cr Richardson said any other developer would be sent back to the drawing board. “At the moment there are way too many boxes without ticks in them, and we would be saying ‘hey come back when you can show you’ve considered them and you’ve got a way forward’,” he said. “(That’s) rather than us simply alerting them to the fact and hoping they will get to it. “We all love a hospital and we understand that a hospital is needed and there’s certainly not a question of council getting in the way of a hospital. The NSW Parliament is today set to debate controversial government plans to privatise the proposed Byron Central Hospital after a move by the Labor opposition yesterday to force the coalition to release all documents related to the development. It comes as a residents group revealed the Ewingsdale landowner of the surrounding land where plans are being pushed through for almost 200 dwellings, a nursing home and shopping centre is the daughter of one of Australia’s richest beef barons who has been buying up prime farmland nearby. Byron Shire Council last week narrowly approved pushing the so-called ‘seniors’ development through to it’s development application (DA) stage, outraging local resident groups who say it should have been deferred for more time to consider the contentious plan which contravened the shire’s new Local Environment Plan (LEP). But comments by Ballina MP Don Page following the council decision that he wanted the private sector to provide surgical services at the hospital has sparked the move in parliament to try and throw light on the hospital plans and the push for privately-run services. Labor’s shadow health minister Walt Secord says his call for papers, known as a Standing Order 52, in the NSW Legislative Council yesterday will be debated this week. ‘It’s an ’an extraordinary step, but this is about finding out the National Party plans for Byron Central Hospital, Mr Secord told Echonetdaily. He said Mr Page’s comments to the ABC pushing for privately-run services followed an announcement by state health minister Jillian Skinner last month that the central hospital’s project team was ‘undertaking a market sounding process to determine whether there is interest from private providers to deliver surgical services at the facility’. ‘The community is worried about the National Party plans for Byron Hospital: the Nationals on the north coast have a poor record on health services,’ Mr Secord said. ‘They introduce paid parking, slash cleaning and maintenance jobs, close services and privatise health on the north coast,’ he said. ‘The Nationals also created the disastrous model of the private Port Macquarie Hospital which had to be purchased by the state government. ‘Furthermore, in the first week, the premier Mike Baird said he wanted to see privatisation of hospital services,’ Mr Secord said. The MLC’s motion calls for the tabling of documents created since 1 April 2011 (soon after the coalition was elected to government) within 14 days, including ministerial briefing notes, email correspondence, financial documents, memos, file notes, meeting papers and meeting minutes relating to the proposed new hospital. Many of the documents sought relate to how the government proposed to run a public-private partnership and provide such services at the hospital. Byron shire mayor Simon Richardson told media this morning there were serious concerns about the development, including sewerage, traffic impacts, access, parking and noise, which would be detailed in council’s submission to tthe government, which is the consent authority for the proposal. Cr Richardson told ABC that any other developer would be sent back to the drawing board to address the issues. Meanwhile, the Byron Residents Group (BRG) have slammed council’s pro-development National Party-aligned majority (Crs Sol Ibrahim, Di Woods, Alan Hunter, Chris Cubis and Greens defector Rose Wanchap) for ‘hijacking’ local planning rules to push the development ahead. community ‘their right to decide if such development was needed or appropriate for this site’. 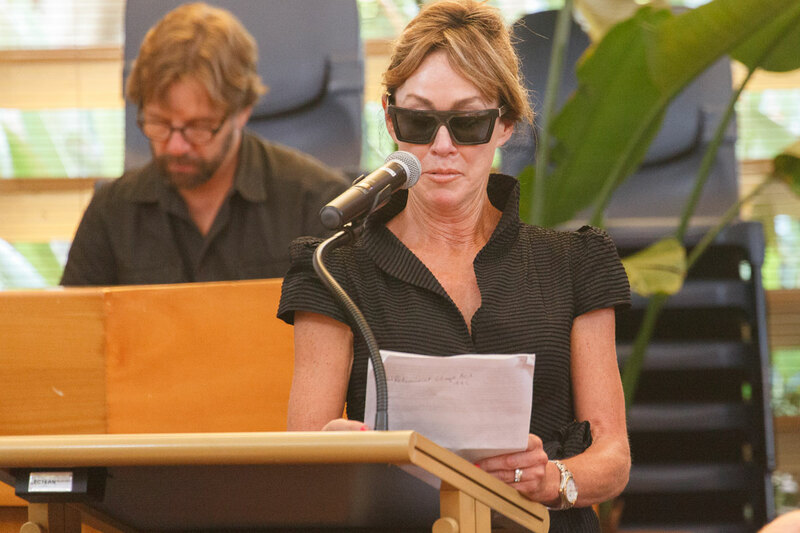 community by referring the proposal to the minister for planning for a “Gateway Determination”,’ Ms Coorey said. Ms Coorey also told Echonetdaily that the developer, Leigh Belbeck, whose company owns the Ewingsdale land and lodged the DA for the ‘seniors’ development, had been ‘portraying the development as something she needs to get done so she can focus on her elderly father, but she forgot to mention he is a multi-millionaire’. Mrs Belbeck is the daughter of J R McDonald, the founder of Bindaree Beef which runs one of the state’s biggest abattoirs and who was described last month in a glowing feature article by a local weekly newspaper as a beef ‘legend’. The Sydney Morning Herald reported in February this year on a bitter dispute at the company’s Inverell abattoir over what amounted to a $2 a week pay rise sought by meatworkers, with JR McDonald threatening to close the plant down if the 800 workers there went on strike. Two years ago Mrs Belbeck, her husband John and son Dane, parted with the family-run beef business they had worked at for most of their lives, with media saying the departures ‘signalled unrest’ at the company. Mrs Belbeck addressed councillors last Thursday, arguing that against residents’ wishes to defer the plan and defending the company’s (Belbeck Investments) consultation with residents. It’s also believed that her father has been approaching longstanding local farmers around Ewingsdale who own prime farmland near the two sites to try to buy up the land. Ewingsdale residents are accusing Byron Shire Council of ‘deliberately’ withholding information from them regarding a seniors living/retail proposal surrounding the Byron Central Hospital. It’s a development which could see the addition of 400 new residents – predominantly seniors – over the 15- hectare parcel, according to a Council planning staff report. Calling it a ‘complete restructure of their community’, Ewingsdale Community Association vice-president Lorissa Barrett said, ‘This large-scale development will see the gateway to Byron Bay changed irreparably and double the population of our village. Due to be debated at this Thursday’s Council meeting, mayor Simon Richardson told The Echo that he will seek councillor support to delay the decision until the Growth Management Strategy is complete. ‘My intention on Thursday is to not consider the application until the completion of the Forward Planning (housing) process,’ he said. For the development to go ahead, Council’s planning instrument, the Byron Local Environment PLan (LEP) 2014, would need too be amended before it is sent to state planners for determination. They include ‘suitable buffer areas between the existing concrete batching plant/electricity station and the subject land to be adequately assessed and provided; and transport networks for pedestrians/buggies within and between the subject land and the hospital to be identified. Additionally, updated traffic studies, a site contamination assessment, sewerage management clarification and an heritage assessment of ‘Buildings and surrounds’. Regarding community consultation, staff added that ‘The planning proposal was placed on public exhibition for 28 days from July 15 to August 11 2014 and written notifications were sent to landowners for the whole of Ewingsdale, totalling 205 letters. Three community information sessions were held in the Ewingsdale Hall on 29 July which were primarily run by the proponents, with Council staff introducing each session and being present for the entire evening session to answer questions from the public. The issues raised in the submissions are also analysed and responded to by staff as part of Council’s upcoming agenda. ‘That is not appropriate community consultation. As residents we feel completely disenfranchised. The community consultation process gave residents only 28 days from July 15 till August 11, 2014 to review and make submissions to a planning proposal, which will potentially change the character of Ewingsdale and the entrance to Byron Bay. ‘The council had it presented to them on April 13, 2013, but July 2014 was the first time we heard about it – and now we hear they are already planning to vote with only a week for us to talk to them! ‘The Community Association organised the meeting in the hall on September 30 and invited the councillors to attend. Council made no attempt to consult with us about the development on their own accord. ‘This is an opportunity to plan a truly amazing gateway to Byron Bay. ‘It should be well thought out and add to the vibrancy of the shire. This development is far from it’.